The aim of this algorithm is to determine when a person who has been exposed to Zika virus needs to be tested and notified, and when vector control measures should be considered around a case. The algorithm is not intended for clinical management of patients with suspected Zika virus infection. Read more in the ECDC Interim guidance for healthcare providers and Zika virus laboratory diagnosis, which contains the proposed algorithm for public health management of cases under investigation for Zika virus infection and an outline of the strategy for the laboratories performing Zika virus infection diagnostic tests. 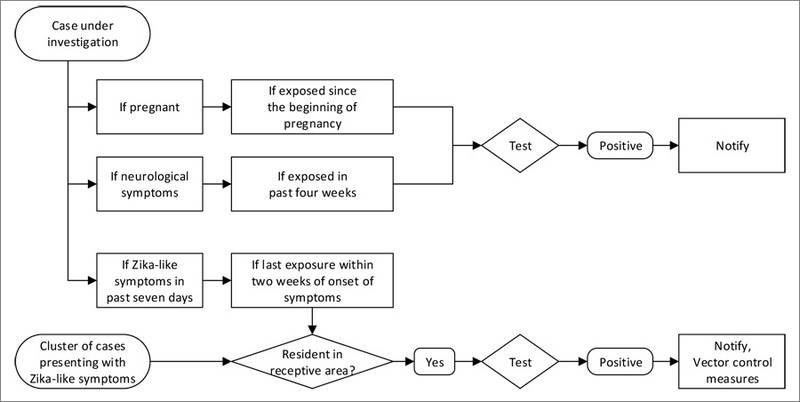 This guidance aims to present an algorithm for deciding whom to test and provide guidance on the laboratory tests for Zika virus infection diagnosis in order to support clinical diagnostic and case reporting through surveillance among EU Member States. This document aims to present an algorithm for deciding whom to test and provide guidance on the laboratory tests for Zika virus infection diagnosis in order to support clinical diagnostic and case reporting through surveillance among EU Member States.